Find hotel near Philippine Military Acade .. The PMA is a premier institution in Philippines. It trains civilians to be talented soldiers who with great valor and bravado defend their country from external attacks. Although it was originally not meant to be a tourist destination, visitors are now allowed to enter the academy to get a glimpse of how the academy functions and take a detailed look at how Philippine’s military has evolved. 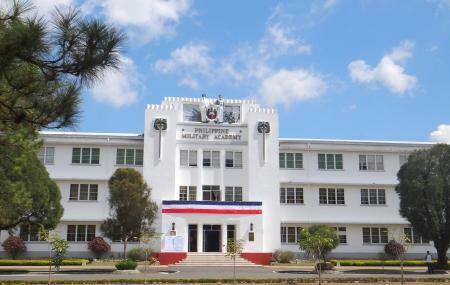 The Academy has its own museum located near the Lopez Hall of Leaders and inside one can get to see photos of the past and present military leaders, old events involving the officers, some memorabilia and dioramas. The grounds itself are very well maintained with plush green lawns and flowering bushes. The Korean War Memorial makes for an interesting visit too, as does the Tree House and the Sun Dial. The Silent Drill Performance takes place on Sunday mornings and is quite a sight to experience. Visitors are asked for an ID at the entrance of the academy. There is an entrance fee of PHP10 for the museum. How popular is Philippine Military Academy? People normally club together Our Lady Of Lourdes Grotto and Tree Top Adventure Baguio while planning their visit to Philippine Military Academy. One of the best places in baguio that I visit. The Place is huge, Its good for walking around,. Its a good place to spot a nice view. The design of their flower is cute. The flower is colourful. One of my favorite places in Baguio. It’s far from the City proper but it’s worth it. There’s so much history. I like the area where the old war tanks, helicopters and airplanes were displayed. There’s a museum, soldiers marching and we even watched their formation at the Grand stage. We ate our packed lunch at a shed along the road among the pine trees and using it was free of charge. I so love this place! This place is like another world full of adventure. Salute. The Philippine Military Academy area in Baguio City is a tranquil place to visit as a tourist. One can really enjoy the peaceful athmosphere, enjoy the sceneries, breath the fresh mountain air & the special scent of pine trees. Really worthwhile to visit in Baguio.